How does the 2048 Puzzle work? 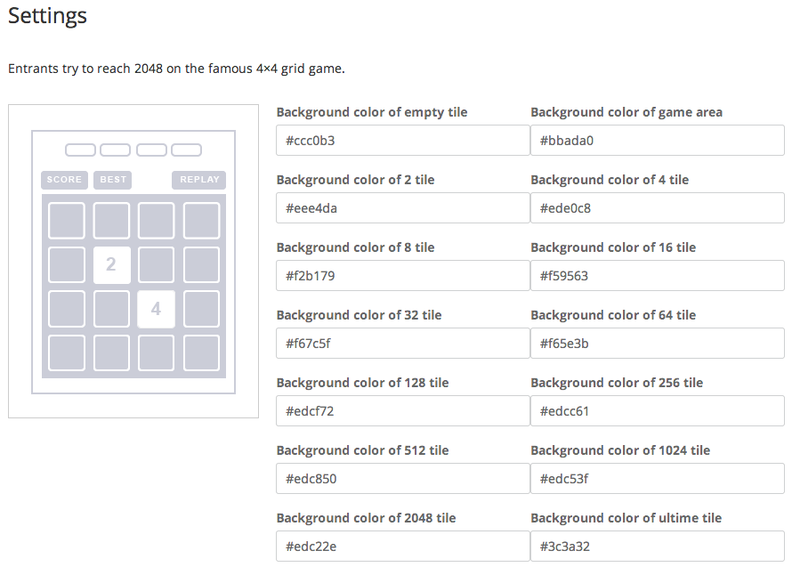 2048 is a mathematics game based on 4×4 grid on which players have to move varying colors tiles (according to their value -power of 2) in order to reach 2048 : as soon as equal value tiles get in touch, they merge. Challenge your fans with a puzzle game ! Find out if this app match your goals with the contest comparator ! How to set up 2048 game? Where can I spread my contest ? Your Twitter promotion app is instantly available on any mobile devices, any Facebook Fan page or any website thanks to the last HTML5 web standards. Recrut new fans & followers (particularly through to the emphasis of social networks through social opt-in, banner and footer). Entertain the fans you already have and develop their engagement. Viralize your operations through the sharing options via email (and give more chance to win) and via Facebook or Twitter. Get a database of qualified contacts retrievable at any time. Is my contest compatible with my browser? To know wether your contest is compatible with your browser, go through our informations about compatibility. As a reminder, Kontest doesn’t exercise editorial control or review over the content or nature of any contest or of any website, e-mail transmission, newsgroup, or other material created or accessible over or through the contests. By using Kontest, you release Krash Studio from any and all liability stemming from such cooperation with local, state, federal and relevant country law enforcement officials. Can't find your answer ?